The Russian Revolution of 1917 was a series of political events in Russia, involving first the overthrow of the system of autocracy, and then the overthrow of the liberal Provisional Government ( Duma), resulting in the establishment of the Soviet power under the control of the Bolshevik party. This eventually led to the establishment of the Soviet Union, which lasted until its dissolution in 1991. The October Revolution, in which the Bolshevik party and the workers' Soviets, led by Vladimir Lenin, overthrew the Provisional Government. While many notable historical events occurred in Moscow and St. Petersburg, there was also a broadly based movement in the rural areas as peasants seized and redistributed land. See also " Russian history, 1892-1920" for the general frame of events. 1917 saw two distinct revolutions in Russia: the overthrow of the Tsarist regime and formation of the Provisional Government ( February Revolution), and the October Revolution in which the Bolsheviks overthrew the Provisional Government. The causes of these two revolutions encompass Russia’s political, social, and economic situation. Politically, the people of Russia resented the autocracy of Tsar Nicholas II and the corrupt and anachronistic elements in his government. Socially, Tsarist Russia stood well behind the rest of Europe in its industry and farming, resulting in few opportunities for fair advancement on the part of peasants and industrial workers. Economically, widespread inflation and food shortages in Russia contributed to the revolution. Militarily, inadequate supplies, logistics, and weaponry led to heavy losses that the Russians suffered during World War I; this further weakened Russia’s view of Nicholas II. They viewed him as weak and unfit to rule. Ultimately, a combination of these four, coupled with the development of revolutionary ideas and movements (particularly since the 1905 Bloody Sunday Massacre) led to the Russian Revolution. The economic causes of the Russian Revolution largely originated in Russia's slightly outdated economy. Russia's agriculture was largely based on independent peasants, who seldom owned modern machinery. Suffering from a naturally cold climate, Russia's growing season was only 4-6 months, compared to 8-9 in most of Western Europe. However, vast territory and population still allowed Russia to be the largest exporter of agricultural products in the world, even supplying North America in the 1900's. The social causes of the Russian Revolution mainly came from centuries of oppression towards the lower classes by the Tsarist regime and Nicholas's failures in World War I. While rural agrarian peasants had been emancipated from serfdom in 1861, they still resented paying redemption payments to the state, and demanded communal tender of the land they worked. Increasing peasant disturbances and sometimes full revolts occurred, with the goal of securing ownership of their land. Russia consisted mainly of poor farming peasants, with 1.5% of the population owning 25% of the land. The rapid industrialization of Russia also resulted in urban overcrowding and poor conditions for urban industrial workers (as mentioned above). Between 1890 and 1910, the population of the capital of St Petersburg swelled from 1,033,600 to 1,905,600, with Moscow experiencing similar growth. In one 1904 survey, it was found that an average of sixteen people shared each apartment in St Petersburg, with six people per room. There was also no running water, and piles of human waste were a threat to the health of the workers. World War I then only added to the chaos. Conscription swept up the unwilling in all parts of Russia. The vast demand for factory production of war supplies and workers caused many more labor riots and strikes. Conscription stripped skilled workers from the cities, who had to be replaced with unskilled peasants, and then, when famine began to hit, workers abandoned the cities in droves to look for food. Finally, the soldiers themselves, who suffered from a lack of equipment and protection from the elements were discontent with Russia's poor accounting in the war. Politically, most areas of Russian society had reason to be dissatisfied with the existing autocratic system. They had no representation in government, and the Tsar remained out of touch with the people's problems. Dissatisfaction with Russian autocracy culminated in the Bloody Sunday massacre, in which Russian workers saw their pleas for justice rejected as thousands of unarmed protestors were shot by the Tsar's troops. The response to the massacre crippled the nation with strikes, and Nicholas released his October Manifesto, promising a democratic parliament (the State Duma) to appease the people. However, the Tsar effectively nullified his promises of Democracy with Article 87 of the 1906 Fundamental State Laws, and then subsequently dismissed the first two Dumas when they proved uncooperative. These unfulfilled hopes of democracy fuelled revolutionary ideas and violence targeted at the Tsarist regime. 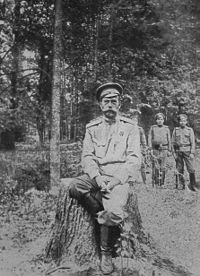 It appears as though Tsar Nicholas II never really considered Russia a constitutional state and invariably held on to his strong inclination towards an Autocratic Russia. "Let it be known to all that I... shall maintain the principle of autocracy just as firmly and unflinchingly as did my unforgettable dead father" - Tsar Nicholas II, 1906, in a speech to the Duma. Beside the economic and social problems plaguing the country, the Russian Empire was still recovering from a humiliating defeat at the Russo-Japanese War of 1905. One of Nicholas's reasons for going to war in 1914 was his desire to restore the prestige that Russia had lost during that war. Nicholas also wanted to galvanize the diverse people in his empire under a single banner by directing military force at a common enemy, namely Germany and the Central Powers. He believed by doing so he could also distract the people from the ongoing issues of poverty, inequality, and poor working conditions that were sources of discontent. Instead of restoring Russia's political and military standing, World War I would lead to horrifying military casualties on the Russian side and undermined it further. From the beginning the troops were not adequately supplied with weapons, or were led by incompetent generals and officers. Logistics were also a problem, since Russia's poorly maintained roads and railroads inhibited communication and distribution of supplies. Almost everywhere Russian forces were matched against German forces who had a superior advantage in weaponry, military talent, and logistics. Russia's recent history was a litany of military failures. Even before the outbreak of the First World War, Russia had lost a war with Japan in 1904–05. Most of Russia's fleet was sunk by the Japanese in that war. While the Russian army enjoyed some initial successes against Austria-Hungary in 1914, Russia's deficiencies — particularly regarding the equipment of its soldiers and the lack of advanced technology (aeroplanes, telephones, poison gas) became increasingly evident. Russia's first major battle of the war was a disaster. In the 1914 Battle of Tannenberg, over 120,000 Russian troops were killed, wounded, or captured, while Germany suffered only 20,000 casualties. Whatever nationalistic or patriotic support the Russian government had gained in the initial time frame leading up to the war had been lost. In 1915, things took a critical turn for the worse when Germany shifted its focus of attack to the Eastern front. The superior German army - better led, better trained, better supplied - was terrifyingly effective against the ill-equipped Russian forces. By the end of October 1916, Russia had lost between 1.6 and 1.8 million soldiers, with an additional two million prisoners of war and one million missing for a total of nearly five million men. These were staggering losses. Mutinies began to occur, and in 1916 reports of fraternizing with the enemy started to circulate. Soldiers went hungry and lacked shoes, munitions, and even weapons. Sometimes entire regiments would be sent to the front without guns, only hoping that before they made contact with the enemy, they would find weapons from soldiers that had been killed in earlier waves. Heavy artillery was also in such short supply in many engagements, that for every 100 shells fired by the Russian forces the Germans would respond with up to 3,000. Rampant discontent lowered morale, only to be further undermined by a series of military defeats. In the autumn of 1915, Nicholas had taken direct command of the army, personally overseeing Russia's main theatre of war and leaving his ambitious though incapable wife Alexandra in charge of the government. Reports of corruption and incompetence in the Imperial government began to emerge, and the growing influence of Grigori Rasputin in the Imperial family was widely resented. Nicholas was blamed for all these crises, and what little support he had left began to crumble. As this discontent grew, the State Duma issued a warning to Nicholas in November 1916 stating that disaster would overtake the country unless a constitutional form of government was put in place. In typical fashion, Nicholas ignored them. As a result, Russia's Tsarist regime collapsed a few months later during the February Revolution of 1917. A year later, the Tsar and his family were executed. Ultimately, Nicholas's inept handling of his country and the War destroyed the Tsarist regime and would ultimately cost him both his rule and his life. The February Revolution was the result of the acute aggravation of the economical and political crisis in Russia. It came about seemingly spontaneously when people of the Russian capital Petrograd started to rally against the war and against the food supply shortages in the city. As the protests grew, various political reformists (both liberal and radical left) started to coordinate their activities. In February the protests in Petrograd turned violent as large numbers of city residents rioted and clashed with police and soldiers, followed by the total strike. Eventually the bulk of the soldiers garrisoned in Petrograd joined the protests, and the uprisen people occupied most of the important places in the city. This had led to the abdication of Tsar Nicholas II in a nearly bloodless transition of power. A new Provisional Government was formed. Between February and October revolutionaries attempted to foment further change, working through the Petrograd Soviet and other organizations. The driving force behind the provisional government was a young and popular lawyer named Alexander Kerensky. Kerensky, as minister of war, decided to continue the Russian effort in World War I despite the enormous unpopularity of the war. He appointed new generals and began a new offensive, the Kerensky Offensive, which started well and then turned into yet another defeat. Kerensky's government tried to shame the soldiers into fighting by creating a Women's Battalion, but without success. The failure of his offensive brought about much resentment from the people. The Russian Civil War, which broke out in 1918 shortly after the revolution, brought death and suffering to millions of people regardless of their political orientation. The war was fought mainly between the Red Army ("Reds"), consisting of radical communists and revolutionaries, and the "Whites" - the monarchists, conservatives, liberals and moderate socialists who opposed the drastic restructuring championed by the Bolsheviks. The Whites had backing from nations such as the UK, France, USA and Japan. Also during the Civil War, Nestor Makhno led a Ukrainian anarchist movement which generally cooperated with the Bolsheviks. However, a Bolshevik force under Mikhail Frunze destroyed the Makhnovist movement, when the Makhnovists refused to merge into the Red Army. In addition, the so-called " Green Army" (nationalists and anarchists) played a secondary role in the war, mainly in Ukraine. Lenin and Trotsky said that the goal of socialism in Russia would not be realized without the success of the world proletariat in other countries, e.g. without German Revolution. Indeed, a revolutionary wave lasted until 1923. The confusion regarding Stalin's position on the issue stems from the fact that he, after Lenin's death in 1924, successfully used Lenin's argument - the argument that socialism's success needs the workers of other countries in order to happen - to defeat his competitors within the party by accusing them of betraying Lenin and, therefore, the ideals of the October Revolution. February 27th * Troops refuse to fire on demonstrators, desertions. Prison, courts, and police stations attacked and looted by angry crowds. April 3rd Return of Lenin to Russia. He publishes his April Theses. April 20th Miliukov's note published. Provisional Government falls. June 3rd First All-Russian Congress of Soviets in Petrograd. Closed on 24th. June 16th Kerensky orders offensive against Austro-Hungarian forces. Initial success. July 2nd Russian offensive ends. Trotsky joins Bolsheviks. July 4th – 7th The " July Days"; anti-government demonstrations in Petrograd. July 6th German and Austro-Hungarian counter-attack. Russians retreat in panic, sacking the town of Tarnopol. Arrest of Bolshevik leaders ordered. August 27th Right-wing General Lavr Kornilov is alleged by Kerensky to have attempted a coup. Kornilov arrested and imprisoned. September 4th Trotsky and others freed. Trotsky becomes head of Petrograd Soviet of Workers' and Soldiers' Deputies. October 10th Bolshevik Central Committee meeting approves armed uprising. October 25th October Revolution is launched as MRC directs armed workers and soldiers to capture key buildings in Petrograd. Winter Palace attacked at 9.40pm and captured at 2am. Kerensky flees Petrograd. Opening of the 2nd All-Russian Congress of Soviets. October 26th Second Congress of Soviets: Mensheviks and right SR delegates walk out in protest against the previous day's events. Decree on Peace and Decree on Land. Soviet government declared - the Council of People's Commissars (Bolshevik dominated with Lenin as chairman).